Lane Degenhardt is from Springfield, Louisiana. He grew up surrounded by strawberry fields, and from a very young age, he has been taught the importance of agriculture and strong leadership. He has served as the Area IV Reporter and the Area IV President. Besides FFA he is also extremely involved in his school’s theatre program in which he has various responsibilities. He is the leader in set construction and is in charge of creating a large array of props. He has been extremely active in his FFA career, competing in dozens of Career and Leadership Development Events including: Livestock Judging, Land Evaluation, where his team placed second in state, and Farm Business Management, where his team has placed both third and second in state as well as, Extemporaneous Speaking, and Parliamentary Procedure. Lane has also served in various chapter officer positions. Lane plans on attending Louisiana State University in order to pursue a career in agricultural education in order to give back to the organization that helped him grow as a leader and develop traits that will further his growth and ability throughout his life. 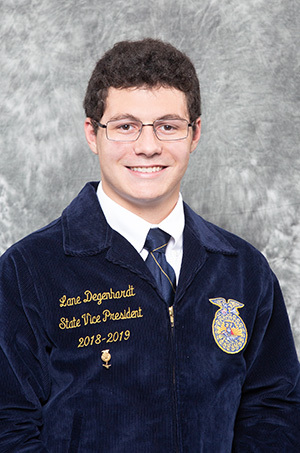 Lane Degenhardt is proud to serve as our 2018- 2019 State FFA Vice President representing Area IV.